As announced on Heise.de, the first special edition of Knoppix 5.2.0 is included in c't magazines 7/07 issued during CeBIT 2007. This version is only available within the german magazine, plus distributed in limited numbers at CeBIT 2007, Heise-booth in hall 5, and at the booth of Rheinland-Pfalz in hall 9, C39/21. The next public download edition (5.2.1) will be issued as CD and DVD probably in Summer 2007. First version of quickinstaller 0wn ("Zero Work Needed"). Explaining the special features für the 5.2 first edition, which are also described in detail within the magazine, Klaus Knopper is giving daily talks at 12, at the Heise booth in hall 5.
tells Knoppix to change the setup of the X-server to support hardware-aided transparency and accelleration, and starts beryl as addon to KDE (or as addon to the desktop that was specified with desktop=choice). An overview of beryls hotkeys and functions, for example desktop-rotation, continuous zooming and transparency etc. can be found in the beryl-Wiki. Warning: Some graphics card manufacturers are not releasing technical specifications because of (as they often claim) "trade secrets". For these cards, there are only very basic, or no, accellerated drivers. The most successful candidates with DRI and transparency in our tests were "older" ATI® cards (i.e. Radeon Mobility) and Intel® onboard graphics chipsets. With these cards, many features of beryl worked flawlessly and stable. For some cards with no existing accellerated open source drivers (especially NVidia® cards), beryl will refuse to start with a warning. If you enforce beryls startup in spite of that, this can result in reset-fast graphics distortions, which sometimes can only be fixed by a "hard reset", i.e. unplugging the power cord for a few minutes. Possible Workaround: If you install, during a live session, the accellerated, proprietary drivers from the graphics cards manufacturer's Linux driver support pages, chances are good that the accellerated 3D functions work fine after restarting the graphical desktop session. But we can not include those proprietary drivers on the free Knoppix-CD or DVD, because of security and license considerations. If you don't want to attempt installing such drivers on your own, yet you would like to see beryl (or other 3d effects), please feel free to check out Games-Knoppix of Martin Öhler, Erik Auerswald and Unix-AG at the University of Kaiserslautern, which also contains some proprietary graphics drivers with permission of their manufacturers, which will also be used for fast 3d games. 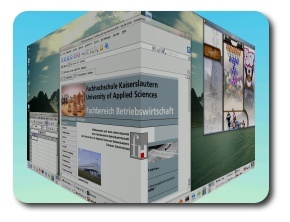 For working with beryl, your computer should have at least 512MB of RAM, or a Linux swap partition about that size, because the 3d and transparency features are notoriously memory-hungry. Knopper.Net is not responsible for the content of external web pages.